JOHN ARMITAGE IS ASSOCIATE DEAN AND HEAD OF THE DEPARTMENT OF MEDIA AT NORTHUMBRIA UNIVERSITY, UK. HE IS EDITOR OF, MOST RECENTLY, Virilio Now: Current Perspectives in Virilio Studies, PUBLISHED BY POLITY. Joy Garnett is an American painter who lives and works in New York City. Garnett’s work is associated with what she calls the “apocalyptic sublime,” a metaphysical condition of combined astonishment and terror in the presence of huge natural or often uncanny human and technological forces. Influenced by contemporary painters that include Peter Doig and Luc Tuymans, Garnett’s work is often based on techno-scientific or photo-journalistic images she collects from the Internet. Garnett can usefully be situated alongside other contemporary artists who examine themes relating to the apocalyptic and the sublime at the junctions of cultural and media politics, dating from the paintings of the late Jack Goldstein, to more recent works by Robert Longo, Thomas Ruff, An-My Lê, and Marc Handelman. Represented by the Winkleman Gallery in New York City, Garnett’s works have been shown at MoMA P.S.1 and The Whitney Museum of American Art. Exhibition catalogs include Atomic Afterimage (Boston University Art Gallery, 2008); Strange Weather, Lucy Lippard (National Academy of Sciences, Washington, DC, 2007); and Image War: Contesting Images of Political Conflict (Whitney Museum of American Art, New York, 2006). In light of her recent solo exhibition at Winkleman Gallery in October 2010, Garnett discusses her paintings and her methods for Cultural Politics with its coeditor John Armitage, who teaches new media and the arts in the Department of Media, Northumbria University, United Kingdom. Garnett has served as Arts Editor at Cultural Politics since 2005. John Armitage: Since your parents were intensely engaged with photography, each in their own way, what was it that made you choose painting as your primary medium? unusual among painters to feel this way – even the most theoretical and methodically driven painters seem to revel in painting on some tactile level like a guilty pleasure. JA: But how does your affection for the directness of image-making, for the immediacy and freedom you associate with painting, accord with your use of “distance-enhancing” vision technologies and photojournalistic source images that you collect from the Internet? JG: The connections between painting and the source images I gather from the Internet and elsewhere took some time to reveal themselves to me, and even longer for me to articulate. I am still articulating them. My interest in the mechanisms of visual mediation dates from when I was a kid helping my dad in his biochemistry lab. My father is an independent research scientist, and for many years he ran a second laboratory in the basement of our house where I was growing up – a scientist’s art studio if you will, where we would conduct experiments. And it’s interesting that you should identify vision technologies, photojournalism, and related practices as “distance-enhancing”: most people assume the purpose of science photography and photojournalism is to close gaps in experience that exist due to distance or invisibility. What such technologies offer, of course, is a very convincing illusion of directness or proximity, which we all buy into in one way or another. So the construction of some portion of the myth of proximity was something that I became aware of whenever my father and I documented an experiment, which generally occurred on microscopic, cellular levels, or else on a molecular level. What was thrilling was the challenge to visually record as well as interpret these new, invisible events, through photomicroscopy, colorimetry, or spectroscopy, where the identifying spectra of different chemical compounds was established. This taught me about mediation and interpretation, and how these processes come into play at very basic levels of perception. I suppose that my engagement in such interpretations in the lab, of participating in the creation of what were, at times, aesthetically amazing visual documents, fed into my proclivities as a painter: a similar process goes on in the studio, which involves a gathering of (visual) data, a tweaking and reworking of this information to reveal or emphasize certain aspects over others (through painting). Since there are obvious differences in how visual “data’ is handled on the Internet –- consider how photographs are couched in the news, for example –and how it gets handled in a painting, in the process of reworking source images into paintings there is always the potential for strange and interesting things to occur. JA: Is it accurate to suggest that it is the “gaps” between the visual data of the Internet, photography, the news, and the medium of painting that characterize what you call the “apocalyptic sublime”? JG: There are certainly “gaps” or disconnects between our first-hand experiences and the pre-packaged kind of visual data we consume 24/7 on our computers, gadgets, and TVs. Increasingly, we blur the distinctions between the two, and it all flows together. While news media narratives inculcate in us a false sense of proximity to events we haven’t experienced, I think painting can inhabit and activate those gaps between ourselves and distant events. So, I think of art not as a bridger of gaps, but as a gap enhancer – rather than attempt to fill the vacuum, art puts you squarely in it. Likewise, I’d like to articulate the “apocalyptic sublime” condition as something that occurs wherever there is a sharp discontinuity between what is expected and what is perceived; it describes what may arise in that vacuum: a metaphysical state of awe combined with horror in face of immense natural or supernatural forces and, particularly in terms of my work, man-made or human-influenced events where technology goes terribly awry. Incidentally, “apocalyptic sublime” is an expression I borrowed from art historian and critic Christopher Phillips, who is a curator at the International Center of Photography in New York City. He so characterized a series of landscapes I’d completed in the late 1990s, writing that in them “the Luminist celebration of the transcendental landscape gives way to the 20th-century encounter with the apocalyptic sublime” (Phillips 1999). 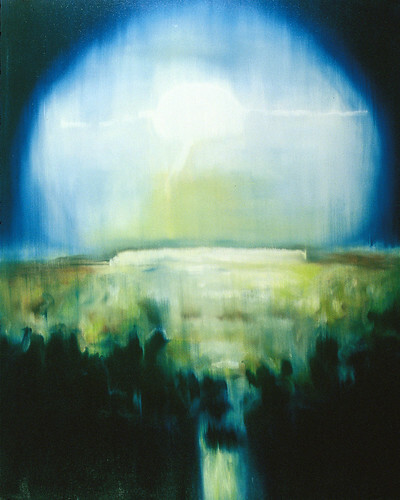 The paintings to which he was referring are based on then recently declassified United States (US) government photographs and film stills of Cold War era nuclear tests carried out in the Southwest of the US and the Pacific. Between 1995 and 1999, under President Clinton, the Freedom of Information Act was amended to allow the release of previously classified national security documents, which initiated the digitization of tens of thousands of hours of historical film footage of atomic testing. Many previously publicly unknown details and images pertaining to the Cold War came to light. This material was then laboriously uploaded by the military to its publicly accessible online archives throughout the late 1990s, which is how I became aware of them. That was the first time I engaged the problem of technologized information as a subject and subtext of painting, as in Christmas Island (Figure 1), and it was a breakout series for me.